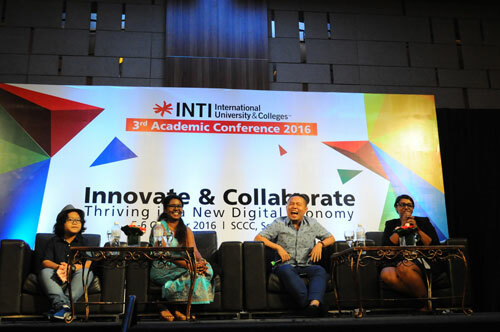 The INTI Academic Conference recently returned for its third consecutive with the theme “Innovate & Collaborate: Thriving in a New Digital Economy”. With a strong focus on the importance of faculty excellence, the conference served to bring together INTI academics to share key developments, trends and practices that will bring about impact to students. In part, the 2-day conference specifically focused on tools, pedagogical strategies and ideas which will drive the development of relevant competencies for faculty excellence. This in return, produces a strong faculty that would bolster the current digital generation into talent for our nation’s future workforce. Delivering his keynote address entitled “Building World-Class Faculty to Propel the Nation to Greater Heights”, YBrs Professor Dr. Mohamad Kamal, Director of Higher Education Leadership Academy, Ministry of Higher Education (MOHE) emphasized that a faculty’s strength lies in its talent and ecosystem. He also discussed the role of online learning in unlocking greater access and quality to education that would help realize the goal in building a stronger Malaysia through improved higher education. In line with strategies underlined in the Malaysia Education Blueprint 2015-2025 (Higher Education), INTI recognizes that blended learning models will enable greater dynamism to and personalization of students’ learning experience on top of fostering lifelong learning – a value crucial to nation building. Using technology, INTI has and continues to find new ways to engage students in acquiring, managing and using knowledge as well as improving the learning ecosystem. Nevertheless, a conducive blended learning environment also requires teachers to innovate their teaching and learning practices. As a higher learning institution, INTI believes in the need to drive innovative teaching and learning practices, be involved in 21st century cutting-edge platforms, as well as provide opportunities for its educators to be relevant, recognized and respected. Among the many measures taken to ensure continuous professional development, career progression, and performance management, the 3rd Academic Conference is one such example to ensure capacity development and teaching excellence within its institution. “Blended learning is not just about using technology. It is also about providing the best possible learning and teaching experience. This should be done in two ways; firstly, by finding better ways of supporting students in achieving the learning objectives and secondly, by supporting teachers in their role,” said Dr. Malini Eliatamby, Vice President (Teaching Innovation) and Deputy Vice Chancellor of INTI International University. “We are proud to have INTI as a partner believer in the potential of blended learning. Through collaborations with tertiary institutions like INTI, we believe that the vision of a greater Malaysia will soon be realized through the noble cause of education”, concluded YBrs Professor Dr. Mohamad Kamal.